Please Note this is a "Dancing Event"
Make a Weekend in London of it ! 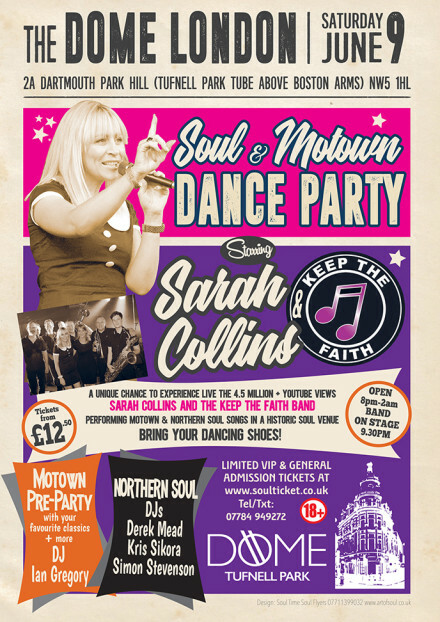 Motown and Northern Soul singer Sarah Collins will be making her London debut with her band Keep The Faith at a gig at The Dome in Tufnell Park on Saturday June 9 th 2018. North Yorkshire-based Sarah has built up an international following with her YouTube videos of song covers which have been viewed nearly 5 million times. It('s) led to an invitation to perform at the Rock'n Roll Hall of Fame in Cleveland, Ohio on May 5th 2018. The gig marks a milestone on Sarah's recovery from a life-threatening setback in 2012. Her career as a professional singer came to an abrupt halt when she collapsed at home, knocking herself unconscious. It wasn't until her fiancé returned from work that she was found and rushed to hospital where she was diagnosed with a brain tumour which was immediately operated on. It was touch and go whether she would make a full recovery and her doctors recommended music therapy as a way to restore her faculties. Her parents gave her their extensive collection of Northern Soul and Motown records and she immersed herself in the music. In 2014, taking medication 3 times a day for epilepsy and unable to perform live, her father suggested that she should post a video of her singing to a backing track of one of his favourite songs on YouTube. The video went viral and she has continued to upload songs to this day – now over 500. The videos led to invitations to appear at Northern Soul events, singing to backing tracks both in the UK and abroad. In 2016, she felt able to return to her first love, singing with live musicians. 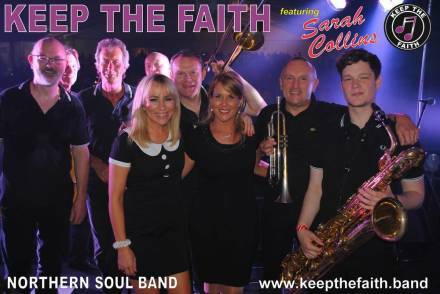 She put together a 9-piece band, Sarah Collins and Keep The Faith. In just 2 years, they've become firm favourites at festivals, events and clubs across the North of England, Scotland and the Midlands, and are now making their first trip to the South. The 500 capacity Dome with its large dance floor has a long association with Soul and Motown. The Capitol Soul Club was launched there in 1999, and the venue recently hosted the 6th Anniversary of the Northern Soul All-Dayers, promoted by www.soulnites.com. Les Csonge, the promoter who was responsible for bringing Kiki Dee back to the stage performing her early Motown songs last year said "I'm delighted to be able to introduce such a fantastic singer and great band to a London audience. With a pre-show Motown Party and a Northern Soul after party to 2am with a top line-up of DJs, it promises to be a great evening. Dancing to Sarah's music is a different experience from dancing to the original artists on vinyl, but one that's not to be missed as she's a superb performer." Sarah said, "I'm so excited to be performing at such a great venue and getting the chance to meet some of our many followers who have long been asking when we would be performing down South. We'll be pulling out all the stops to make it a night to remember !"